DeKalb County Georgia is the nation’s greenest urban county but only 21% of county residents participated in curbside recycling. Increasing residential curbside recycling participation can reduce tonnage carted to the county landfill and potentially offset future increased sanitation costs. They needed an awareness building campaign to engage citizens to recycle. Recycling is not difficult if you know how to do it. We developed awareness and outreach programs for DeKalb County to improve understanding of recycling, starting with the basics: how to get a bin, how to recycle, and what goes in the bin. 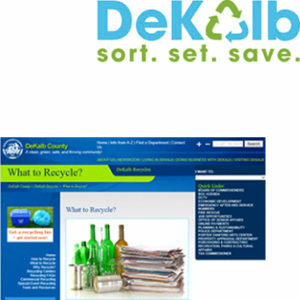 The campaign, DeKalb Recycles, included public relations, social media, web design, a downloadable toolkit for community organizations and promotional materials. The result–over 4,000 homeowners requested recycling bins within three months.